Wednesday was a big day for Amazon, as it revealed an array of new devices at an event in New York. 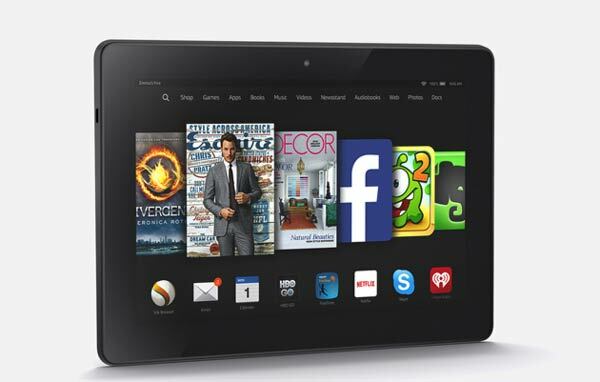 We saw a complete refresh of its Kindle Fire HD tablet lineup. The new tablets include some super affordable choices designed for both casual users and kids, and also a high-end tablet with specs high enough to compete with the Apple iPad Air. Let’s take a look at the more affordable new Fire HD 6 and 7-inch tablets first. With the two new models, Amazon aims to tackle the low-end tablet market, since it sells hundreds of models on its online shop already, most of them from companies we’ve never heard of. However, with the low price points of these little-known brands, quality is often an issue and the tablets often end up being returned. The new Fire HD tablets are the answer to these problems, with pretty generous specifications and durable builds. They both house a decent quad-core Media Tek CPU, a HD 1280x800p display, and both front and rear cameras. The tablets also have a rugged industrial design that is said to withstand drops from up to 1 meter, and violent jostling which may happen in a back-pack or suitcase, something that many cheap tablets will not survive. The 6-inch model is priced at $99 and the 7-inch at $139. Both tablets comes with Fire OS 4.0, Amazon’s Android-based operating system and includes bonuses such as unlimited online photo storage and Family Library, allowing up to two adults and four children to share content they’ve purchased. These tabs will be available in 5 colour options, however, the Mayday video tech support that is seen on the Fire Phone and higher-end Fire tablets will not be installed. We then come to our iPad competitor, the 8.9-inch Kindle Fire HDX. The upgraded new version keeps the same design and 2560x1600p resolution as its predecessor, with a big bump in processor and a 70 per cent faster graphics engine. The HDX will be the first tablet to feature Qualcomm’s fast 2.5GHz Snapdragon 805 processor and has a new light sensor with Dynamic Light Control that automatically adjust the screen contrast to imitate the look of paper in varying lighting environments. With the high-end tablet users will also receive Firefly, Amazon’s image-recognition technology, and Mayday tech support. Amazon boasts the 375g tablet for being 20 per cent lighter than the iPad Air, although the smaller screen should be taken into consideration. The tablet will start at $379 and the company is offering an optional 2-in-1 style Bluetooth keyboard to go with it. Something that may interests parents this holiday season is the Fire HD Kids Edition tablets, designed especially for young people aged between 3 and 10 – on both the hardware and software front. 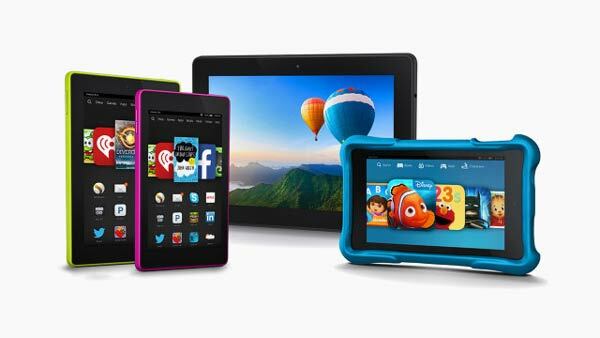 The specs are pretty much the same as the Fire HD tablets above, however, for $149 (6-inch) or $189 (7-inch), the Kids Edition comes with an ultra-durable case for any tosses and drops, making it extra safe for kids to handle. 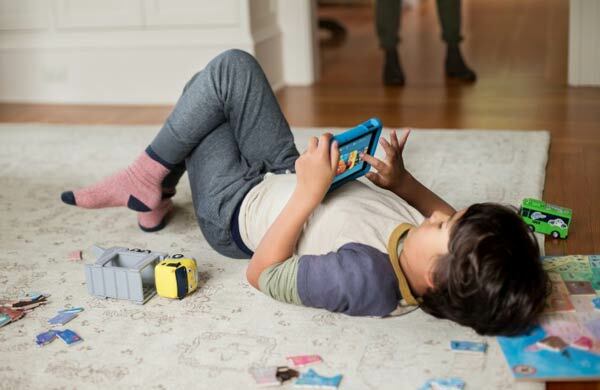 Amazon is giving users a Worry-Free 2 year Guarantee which will cover any damage, no matter what the little one does to the tablet. Software wise, the company will include a year of FreeTime Unlimited for access to 5,000 child-appropriate books, TV shows, apps, movies and more. The tablet’s Free Time function will allow parents to set time limits on individual apps and establish goals and clock time spent on reading or educational apps. For example, your little princess will have to complete 30 minutes of reading before she can access her favourite game. The UI of the Kids Edition simplified, with no access to the AppStore, the web, email or anything that could potentially be costly to the parents or display unsuitable content. Parents that would like to access this content can simply change the settings back to standard mode. Besides updating its tablet portfolio, Amazon also introduced the Kindle Voyage; a high-end e-reader the company is touting to be the closest e-reading experience to plain paper. 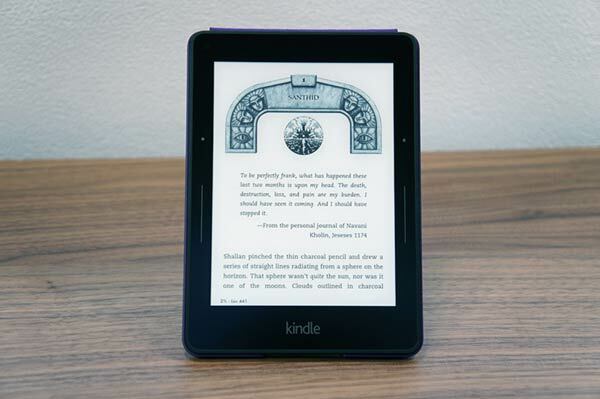 Weighing in at only 180g, and measuring 7.8mm in thickness, the 6-inch, all-glass face Kindle Voyage features the clearest display the company has so far created, at 300ppi, and has a single-mold magnesium body. It is priced at $199 and is the online retailer’s thinnest e-reader yet. It is 39 per cent brighter than the $100 Kindle Paperwhite, making it easier on the eyes even in direct sunlight, with a slightly speckled screen texture which will evoke the touch of that high-quality paper fibre. When are these new tablets available? Amazon will not be shipping any of these new products until October, but is taking pre-orders now. We know that Apple may be gearing up to unveil its new iPads in the coming weeks so perhaps Amazon is aiming to get a head start on sales, especially with the holiday season coming up.